View More In Gate Latches. 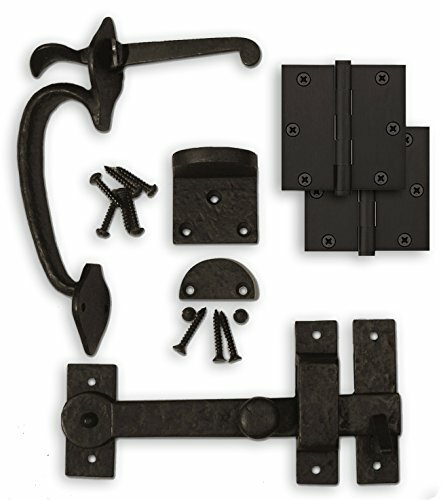 A Solid-Cast Bronze / Brass Complete Gate Kit that can be used a complete solution for gates, doors, barns, sheds, and more. It is fully complete from Hinges to Handle/Pull to Drop Bar and a Gate Stop. Includes mounting hardware for an easy installation that will make for a unique and wonderful addition to any piece. 2 Hinges: 4-1/2" x 4-1/2", Square Corners (Solid Brass) Thumb Latch: 8" x 1-3/4" - Tail Piece: 3.5 Drop Bar: Bar - 7-1/2" - Catch Plate - 3-3/4" x 1" Gate Stop: Plate - 2" x 2", 1-3/4" Tall - Comes with Stop Pad Over time, if installed outdoors, the solid cast metallic bronze hardware darkens to an old-penny brown then eventually to a greenish/blue patina. These colors compliment the browns and greens in nature and do not distract from the natural beauty of the landscape. If you have any questions about this product by Coastal Bronze, contact us by completing and submitting the form below. If you are looking for a specif part number, please include it with your message.